Zimbabwe, officially the Republic of Zimbabwe (Nyika yeZimbabwe in Shona), is a landlocked country in southern Africa. It borders South Africa to the south, Botswana to the southwest, Zambia to the northwest and Mozambique to the east. At the moment, there is no official currency, so people use various currencies to go about their daily life, such as the British pound, South African rand and American dollar. The capital is a city known as Harare. Zimbabwe is a landlocked country that is located between two rivers (Zambezi to the north and Limpopo to the south). The country of Zimbabwe is surrounded by five neighbours, that are the countries of South Africa, Zambia, Mozambique, Malawi and Botswana. Zimbabwe is a haven for diamonds (in one of its provinces), though Zimbabwe has shut down these mines since March 2016. The country is divided into ten provinces, that is Harare, Bulawayo, Masvingo, Mashonaland East, Mashonaland West, Mashonaland Central, Matabeleland North, Matabeleland South, Midlands and Manicaland. Zimbabwe has plentiful rivers, the longest one being the Zambezi River, stretching for over 1,500+ miles going through Zimbabwe and Zambia. Along with rivers is that Zimbabwe has a lot of mountains, the highest being Mount Nyangani, located in Nyanga National Park in the Nyanga District. The mountain is 2,592 m (8,504 ft) high! Zimbabwe has been a fully independent country since 1980, but it declared independence from the United Kingdom in 1965. Before independence, Zimbabwe was known as South Rhodesia. British explorers and foreigners arrived to Zimbabwe in the 1850s, and due to the increase population of British people (and fights between the British and the Zimbabwean King Lobengula), Zimbabwe became a British colony. Back then, though, it was called "Rhodesia", and not Zimbabwe, after Cecil Rhodes of the British South African company. African people were oppressed under the British rule, as the British denied Africans to vote and forced African landowners of their land. Even though King Lobengula was defeated by the South African company in 1893, the African people of Rhodesia protested and fought. One of these fights between the Africans and the Europeans was the First Chimurenga War of 1896-1897, led by Mbuya Nehanda and Sekuru Kaguv. Though unsuccessful, it might've influenced the African people to stand up for themselves, as political unrest and protests never stopped for more than 50 years. In 1966, the Battle of Chinhoyi of the Second Chimurenga war initiated. This resulted in intense gunfights and battles between the Rhodesian forces and the African People of Zimbabwe. The ZANU (Zimbabwe African National Union) and the ZAPU (Zimbabwe African People’s Union), supported by the African countries of Zambia, Tanzania, Mozambique, Botswana, Tanzania, as well as supported by China and the Soviet Union, fought against the Rhodesians for over ten years. Due to the support of so many countries against the Rhodesian forces, the Africans won when the Rhodesian regime and the British government met at the Lancaster House Conference to grant the Zimbabweans independence in December 1979. The independence of the country came peacefully, with Robert Mague, as president, and Canaan Banana as ceremonial President. On November 2017, a coup d'etat resulted in Mugabe being placed under house arrest, and later, resigning (on November 21, 2017). Emmerson Mnangagwa was placed as the country's new president. After gaining independence from the British, the official currency of Zimbabwe was the Zimbabwean Dollar (though suspended and not used anymore). Though, that was replaced by the use of multiple currencies, with the main currency being the US Dollar. The economy took a turn for the bad in 2000, when poverty became widespread and a rate of 95% (unemployment) was measured. The country's participation in a war outside of the country drained a lot of money. The suspension of it's own currency resulted in hyperinflation from 2003-2009. There are 16 official languages in Zimbabwe. The most widely used languages are Shona, Ndebele, and English. English is the language of business and politics in Zimbabwe. The most famous feature of Zimbabwe is Victoria Falls which is a World Heritage Site. Other areas include Hwange National Park, Great Zimbabwe, Matopos (the place where Cecil John Rhodes was buried), Mushumbi Pools, Troutbeck (located in Nyanga) among other interesting places. Victoria Falls (or Mosi-oa-Tunya, The Smoke that Thunders) is a popular UNESCO World Heritage site (since 1989). Victoria Falls was named after Queen Victoria of Britain (even though the Lozo name, “Mosi-oa-Tunya”, is widely used in Botswana). 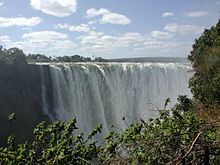 Located on the Zambezi River (bordering Zambia and Zimbabwe, which is why the Victoria Falls is split into two, one belonging to the other), the amazingly beautiful water-filling World Heritage site brings 500 million+ cubic meters of water per minute to a plummet and several flocks and flocks of tourists. Victoria Falls holds the width of 5,000+ feet and the height of 300+ feet, inside that much area are six gorges, all of these being numerically named, and the 6th gorge named “Songwe”. All of these [gorges] are over 1.50 kilometers long. Victoria Falls is accompanied by the Victoria Falls National Park in Zimbabwe. This page was last edited on 19 January 2018, at 01:22.